A multi-tool is a very handy device to have with you no matter what your field of activity is. Are you a policeman or a survivor that likes to play life the hard way? Or maybe a biker who loves steep trails. In all situations, a multi-tool will be the best companion that you can have. Multi-tools evolved a lot in recent times and now we can see a literally humongous diversity from which one can choose. That’s incredible but also tricky. If there are so many types of multi-tools, which one should you choose? Here is where this review might save you a lot of your precious time. We made a fine selection of multi-tools for every possible situation, combination, and need. This article is rather long, so you may want to use our quick search tool at the top to help you jump straight to where you want. If you want a direct comparison between brands, here’s Leatherman vs Gerber for you. The hiker’s nightmare is carrying any big, bulky, weighty tool along that adds up to the overall weight of his or her backpack. Thankfully the Leatherman Super Tool is lightweight enough to carry in your pocket. 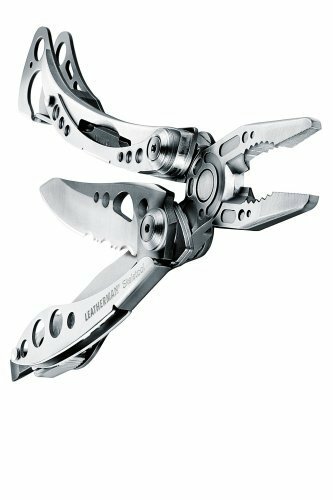 This is one of the most appreciated multi-tools from Leatherman in terms of reliability, quality, and ultimately value for the money. That being said, this is a very effective multi-tool in every sense. It is easy to use and the tools open up without any hassle. I just love how Leatherman implemented every feature of it. The items you receive differ from seller to seller but in general, the stock leather sheath fits like a glove on the multi-tool. You can always buy one separately since Leatherman offers pretty good stock options. It is precisely designed to use the entire space without any waste and play, also giving you great portability and ease of carry. They nailed it pretty well on the sheath topic. 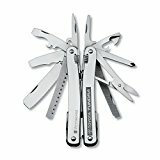 The Leatherman Super Tool multi-tool has been bought by many people all around the world for various needs and their experience with it speaks the loudest. Most of the buyers are very happy with their choice and so would you if ever consider buying this multi-tool for your hiking or outdoor adventures. When speaking of tactical gadgets, SOG knows what they are doing. They are very skilled when it comes to professional and tactical items because they, like Leatherman, worked in this field for 30 years. They have some of the best designers and craftsmen, that any other company would love to have. Quality and details are very important at SOG and this multi-tool is a good example of the quality work that they do. We’ll start by saying that it features a PowerAssist mechanism for more ease when pulling out the blades. It basically has the blades placed on the outside and are easier to deploy, while the assist mechanism completes the opening. The blades are made from 420HC steel. One of the blades is fully serrated and the other is a fine edge with a black oxide finish. It is packed with 16 essential tools in total. Basically, everything that you will need in your tactical missions and deployments from good blades for fast cutting to wire crimpers and a bottle opener. An interesting technology that the SOG multi-tool incorporates is the Compound Leverage mechanism that works by employing multiple points that create a greater handle travel with the pliers’ movement. That means you will get a leverage advantage of approximately twice the power of an ordinary multi-tool. Overall a great multi-tool that we think is worth its money for what it offers. 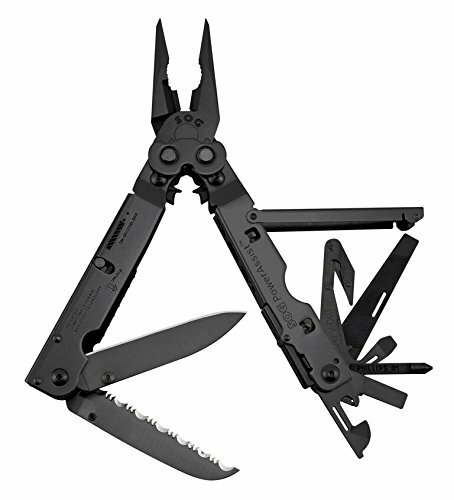 Great for tactical situations or missions, this SOG multi-tool might save you from a lot of impossible situations where a real tool is 50 miles away from where you are. When in the woods hunting your prey down, the blades on your multi-tool are some of the most important parts. You want them to be sharp, made of high-quality steel and be as reliable as possible. But when you say Leatherman, you automatically say quality. 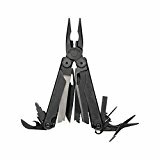 Made of durable stainless steel and coated with black oxide, which is a powder-based metal coating that gives the multi tool a professional feel and increased resistance to corrosion, the Leatherman multi-tool is great for any environment. Talking about the blades for a second, there is a clip-point one that is razor-sharp and can penetrate many kinds of materials. Then there’s a serrated knife blade that helps a lot when you need to cut a rope or a wire. Other tools include wire cutters, a lanyard ring, a Phillips and Flat Tip Eyeglasses Screwdriver, regular and needle nose pliers, wood/metal and diamond coated file and two different drivers, a large bit and a small bit. For the money you are paying for this multi-tool, we think you get more than you would expect. It includes a large variety of tools and a high-quality body for a good price. You can make the purchase with confidence knowing that your multi-tool won’t fail you. The last thing you want when in a survival situation somewhere far away from any form of civilization is to realize that your multi-tool doesn’t have the tool you absolutely needed and, worse yet, the multitool broke because it was poorly manufactured. Thankfully, that is not the case with the Leatherman New Wave Multi-Tool (and I might add, with Leatherman multi-tools in general). Depending where you buy this multi-tool from, it comes with a sheath which is fine, allowing you to carry it in both pliers configuration and fully closed. 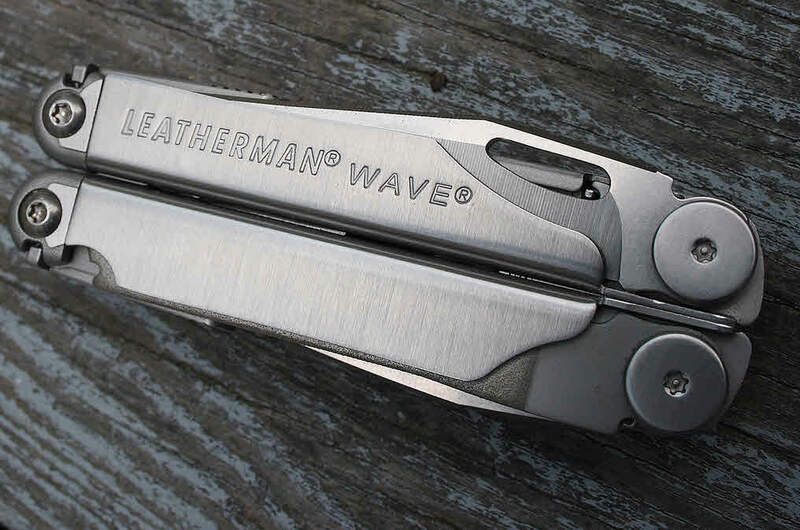 This version of the Wave Leatherman is a bit bulkier and weighty than the MUT model but it still is carry friendly compared to others like Gerber. Although you will probably not be able to chop on trees with these knives, they still hold up incredibly well and have razor-sharp edges for small cuts and emergencies. It has a fine edge blade and a serrated one. A very nice feature that is so simple to implement but so many multi-tools lacks is the lock of all tools when deployed. They simply stay where you want them to and this is a big plus just because it prevents any type of movement or slippage that you didn’t want. It’s so simple yet so rare. As optional accessories, you can get the Bit Kit to expand the capabilities of the multi-tool with 21 double ended bits, although we don’t think you would need those in a survival environment. 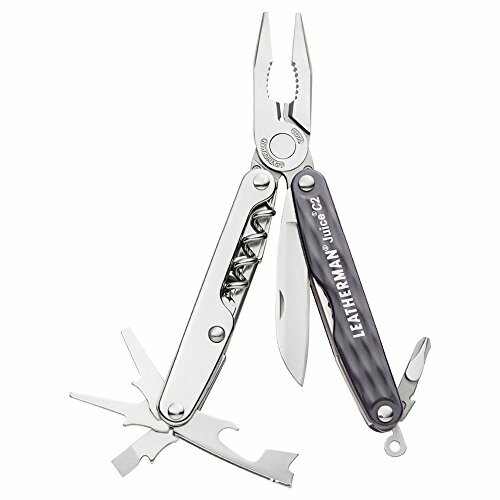 Leatherman provides those for people who use this multi-tool in a more industrial environment. For a decent chunk of money, you get a high-quality multi-tool to get the job done fast and hassle free. 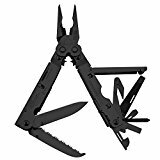 This is a great multitool for army men or other military personnel for use on the battlefield or battleship. It’s a reliable and powerful multi-tool for any situation as demanding as it may be. From everything like weapon maintenance to explosives and everyday use, the Leatherman OHT offers the right tools to get your job done quickly and professionally. 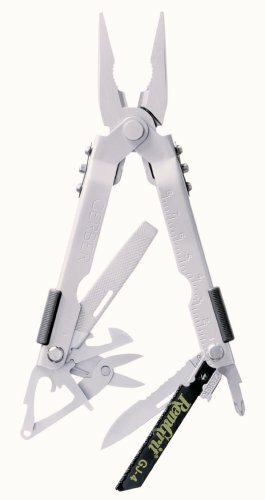 A feature that sets it apart from other multi-tools is the spring action pliers and wire cutters. This mechanism ensures an easy operating of the tools with only one hand and added force for better grips. Speaking of this mechanism, the spring actioned tools are the regular and needlenose pliers, and the replaceable wire and hard wire cutters. • High-quality knives with both serrated and straight edge blades. When we said it is operable with one hand we didn’t lie. It is 100% operable with one hand, a huge advantage when on the field and time is not your best friend, and you neither have three hands. The sheath is an okay one but Leatherman offers better ones with similar multi-tools. If you are not happy with this one you can get a better sheath for as low as 9 bucks. The grip of the pliers is strong and can be a feasible replacement for real pliers. 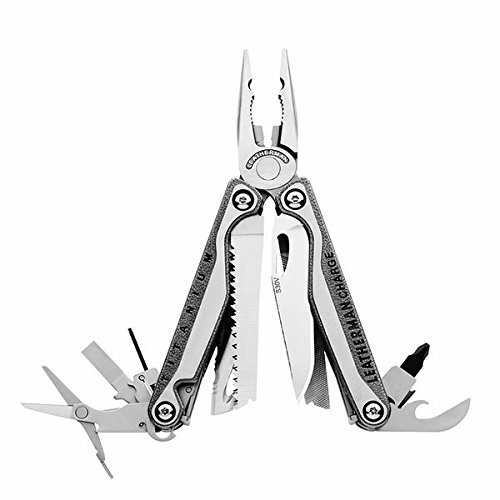 We think you will love the experience of handling this well made multi-tool. You are at your tent place deep in the woods. You’ve just started assembling the tent. With one hand you hold a rope that needs a cut and with the other you reach for your knife. But wait, your knife is in the backpack and all you have with you is the multitool. But wait again, opening an ordinary multi-tool with just one hand is almost impossible. Well, you smart pants that you are, you got that covered when you bought a Leatherman OHT. This nifty tool allowed you to avoid a lot of hassle. It features a stainless steel body which is durable and rugged that believe it or not, will last for decades. The quality of materials Leatherman choose to use is unmatched. People all over the world praise this multi-tool for resisting for years without showing any weak points. That is precisely why Leatherman gives away a 25-year warranty with this multi tool. A nice feature is a visual imprint on both handles that indicate the interior tool. This way you won’t lose time deploying the wrong blade or tool. Pretty interesting that not a lot of multi-tool manufacturers incorporate this feature because it is a quite simple detail that saves a lot of time. To list a few of its tools: it has two types of pliers – needlenose and regular, both with spring action, two knives made of 420HC steel, wire cutters, four screwdrivers, a strap cutter, a can opener, a saw, an oxygen tank wrench and much more. Depending on your seller it would probably come with a MOLLE sheath, safe locks for all blades and tools to avoid any injuries at a weight of almost 10 ounces and a closed length of 4.5 inches. 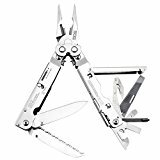 We think the Leatherman OHT is the perfect companion for any outdoor person that wants a reliable multi-tool that will help avoid a lot of hassle, all at a good price. 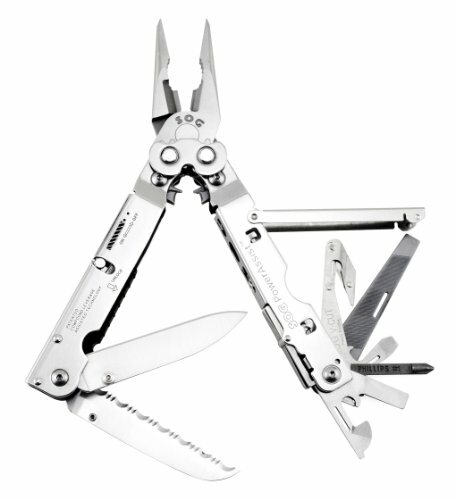 Leatherman is the king of multi-tool manufacturers. They have an experience of over 30 years manufacturing professional multi-tools, knives, and pocket tools. They are based in Portland, Oregon USA and enjoy making tools that people love. The 850021 has a stainless steel body and handles for added resistance to corrosion from moisture and substances, a handful of blades, a saw type one, and a fine edge blade. The pliers are of very good quality and have a very good grip on everything you might want to use it on. The small hammer at the bottom has made a real topic of discussion with multi-tool enthusiasts. Although it might look like a joke, it really is a very handy hammer. It won’t smash things like a true hammer would, that’s for sure, but you might be surprised of what it’s capable of. Other features it has a Bronze Carbon Scraper and Titanium Pocket Clip that makes it easy to carry around. It also has outside accessible blades that make it easy for one-handed opening. 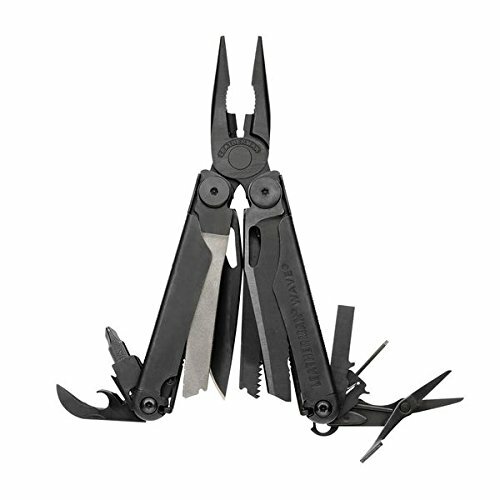 The Leatherman MUT Multi-Tool is what we consider the best multi-tool for the money. It has anything you would expect from a quality manufacturer with all the perks and features at a good price. Gerber in association with the legendary survivor Bear Grylls made an entire survival and outdoors series of knives, tools and multi tools specially designed for the outdoor maniac. 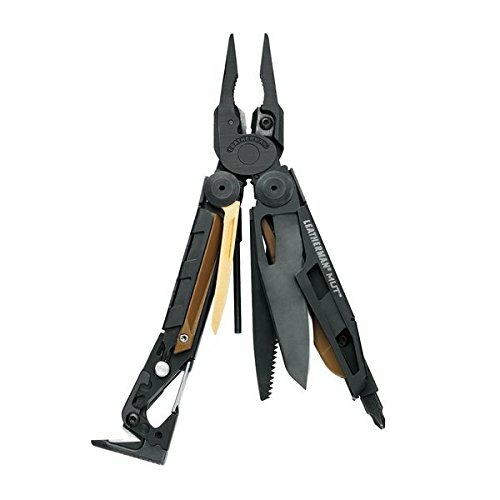 The Gerber Bear Grylls Ultimate multi tool is a good example of great design and skill incorporated in a high quality tool. The Oxford dictionary defines bushcraft as “skill in matters pertaining to living in the bush”. 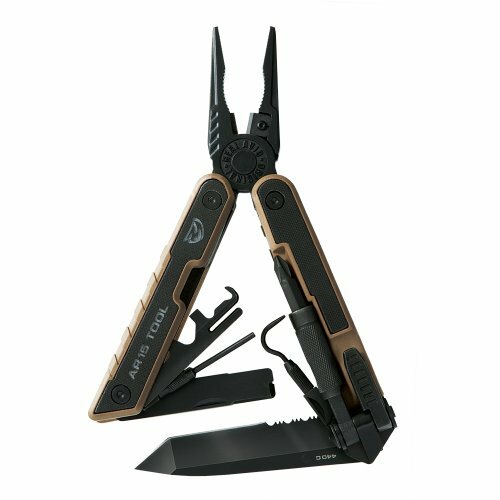 Now that we know we are talking on the same topic, let’s see what the Gerber Bear Grylls Ultimate multi-tool has to offer. It comes with a spring-loaded jaw for simplified single-handed use, a very important thing considering that at most times you already have something in one hand and want to finish the job with the other. This is good especially that other multi-tools at stiffer prices don’t have this feature. The ergonomic textured rubber grip maximizes comfort and reduces chances of slipping from the hand and the 12 stainless steel components offer the essential tools you will need. It is lightweight and offers the following tools: Small and Medium Flat Driver, a lanyard ring, bottle and can openers, scissors, wire cutters, Phillips Screwdriver, saw, serrated high-quality knife, fine edge blade and needle nose pliers. Also, the patented Safe T Plus System enhances safety by locking components into the usage position. This varies from seller to seller but along with the multi tool itself you would probably receive a nylon sheath which is fine but not the best out there, and a very handy pocket survival guide with recommendations straight from Bear Grylls. Are you an avid bushcraft person that wants only quality tools? Then the Gerber Bear Grylls Ultimate multi-tool is definitely for you. 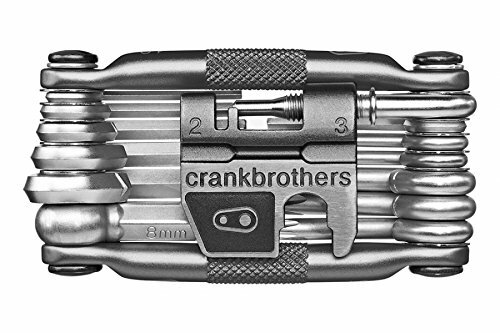 A tremendous amount of customers buys Crank Brother products for maintaining their bike in good functionality, especially the Multi Bicycle tool that incorporates a number of 19 functionalities in a lightweight solid casing. For emergency usage, you will get most of the tools you need to get your bike up and running. It has the following: 6150 High tensile steel bits with an aluminum frame, spoke wrenches to fit size 0,1,2,3, Hex wrenches for 2/2.5/3/4/5/6/8mm, open wrenches for 8 and 10 mm and the chain tool which is 8/9/10 speeds compatible so you get a large variety of tools in a very small multi-tool. Just imagine carrying the full-size tools separately with you. You would probably need a 0.8-1 feet tool box. The aluminum case is very light and easy to store. Due to this, you can pop it in a backpack really quick and hassle free knowing that when your bike malfunctions you are covered. Basically, no matter if you own a mountain bike or a regular road bike, the mechanism is pretty much the same and the Crank Brothers multi-tool has what it needs. You may encounter small problems with the flapping chain tool. But this can be easily fixed by unscrewing the tool from its pin and pushing a snug rubber past the threads. For the price, you get a fully equipped bike multi-tool that will save you from a lot of hassle. We consider that it is a great buy. Victorinox manufactures some of the best watches swiss knives and multi tools on the market. They have a long-standing experience in producing swiss knives and as we see now, multi tools. The Victorinox SwissTool Spirit Multi-Tool is one of the best multi-tools you can get for the money for a lot of reasons. The build is compact and has a sturdy body made from a quality stainless steel. It has a total of 27 functions for any type of situations you may find yourself in. Cons: No ruler(although if you really need one you can draw it by yourself) and the dead pins that connect the whole tool. Because they used this type of connections you cannot remove or change the inner tools. It comes in a leather pouch and it is made in Switzerland with extreme care by swiss craftsmen in order for you to get the most out of your multi-tool and don’t have doubts about the quality. Also, it comes with a lifetime warranty straight from Victorinox so if you ever think it doesn’t meet your requirements or has any manufacturing flaws you are covered, although we don’t think it will ever be the case. Know that feeling when doing some house work and forgot your tool box outside? You have to get up, go search for it, and after finding it you need to search for the suitable tool in order to get your job done. And that can take up a lot of time that otherwise could be used in doing that thing. This is where the SOG PowerAssist Multi-Tool will save you. It is easy to carry so you can attach it to your clothes so that you have it with you at all times as opposed to a tool box. As a previous model of SOG, this model has a PowerAssist mechanism that makes the deployment of blades much easier. The blades are made of a high-quality 420HC stainless steel that will last shiny for a long period of time. It packs 16 different tools that are made of quality steel from can openers to blasting cap crimpers. And above all it has locks on both the blade and tools to protect you from injuries and allow a safe storage wherever you want. The only negative parts we see so far are the polished handles that can become slippery when water comes in the game. A brushed or blasted finish would have been a better choice for a DIY multi-tool because various liquid spills are a frequent topic here, but that’s that. It can be easily fixed by attaching a piece of material to the handles or wearing work gloves with those tiny nonslip dots if you know what I mean. It comes with the SOG limited lifetime warranty that covers most of the damages that will occur (if they ever will). If you think it got what it takes to be your next DIY multi-tool, go for it, it is a safe buy. For the price, this multi-tool is a great choice. It is simply one of your best choices if you like riding your bike in various terrains that might damage it and a quick fix is needed. Here is why we think the Topeak Alien 2 should be yours to go bike multi-tool. It has a number of 26 tools in total. 26! It was made using both professional and amateur riders in order to get the feel of regular inexperienced bikers that want it simple and professionals which demand quality and utility. And it seemed that the combination was incredibly benefic to the end result. The tools are made of hardened steel and the body is made of engineering grade plastic so that you get resistance and lightweight at the same time. In a nutshell, it includes everything a bike tool should have like spoke wrenches, a knife blade, tire levers, and even a bottle opener. It also has a spring-loaded belt clip for easy attachment to a backpack or whatever you may want to attach it to. Although in most cases you will be able to do your job with the tools included, the 15mm wrench might disappoint you a bit. Because with a little tiny 2-inch long wrench, you won’t get the torque available on a more serious real wrench. When you will get a heavily tightened pedal or something this may be a little problematic. The manufacturer tried to fix the incredibly small leverage with a large Allen that can be inserted but this only solves a part of the problem. But remember that multi-tools are not intended to be real tools and for what it is, we think it offers the best possible. 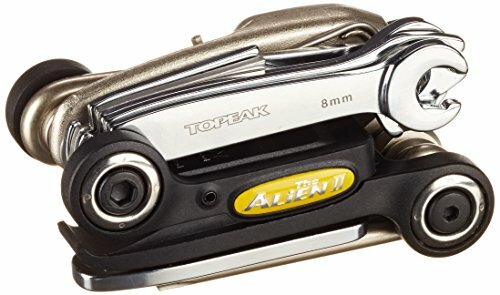 When you will have a breakage on your bike right in the middle of nowhere you will thank yourself that you attached the Topeak Alien 2 multi-tool on your backpack. Go for it. It is the smartest choice you can make for the money. 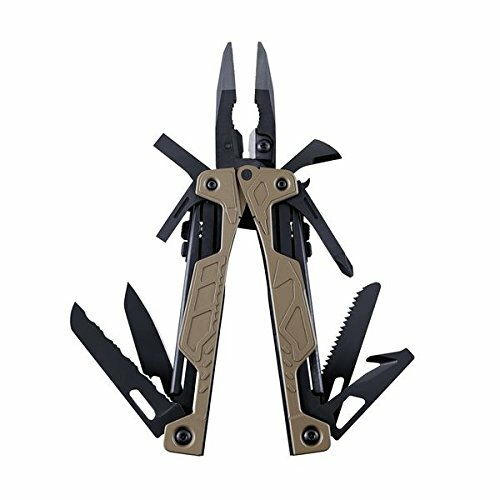 Many customers around the globe adore this multi-tool mainly because it is so well made and offers some of the best tools in the multi-tools world. Let’s start off by saying this is not the average multi-tool that you have thrown away in a drawer in the back of your house. 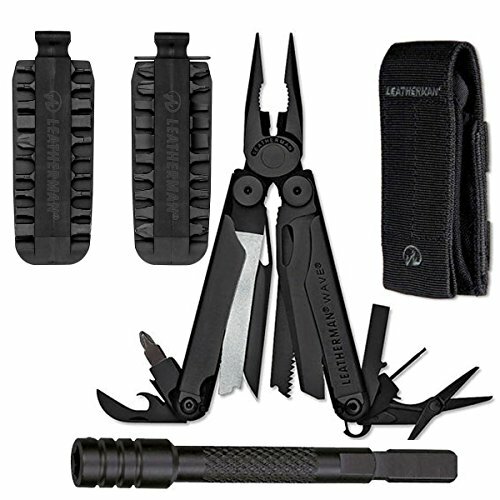 You’ll see that immediately after you make the purchase you will try to find any kind of job to put the Leatherman to use more. It’s like a top smartphone of which you become addicted. The TTI clip-point blade is made of an S30V stainless steel that offers optimal edge retention, flexibility, and toughness. The handles have a good grip and are made from a material you don’t often find on other multi-tools, a premium alloyed titanium that is corrosion resistant and feels awesome in the hand. That is especially what you want on a multi-tool for firefighters because it may encounter from fire to corrosive substance spills that would damage others but not the Leatherman. As other tools it has a cutting hook that slices through seat belts and even linoleum very easy, wire cutters, regular and needle nose pliers, wood and metal file, saw, wire stripper, fixed lanyard ring, bottle and can opener, ruler, removable pocket clip, hard wire cutters, diamond coated file and the multiple bit drivers let you customize the bit selection to fit most situations. Speaking a little of the blades, there are two types, straight edge and serrated that are made of the premium S30V steel as said in the beginning. If you know a little about steel types on different knives you know that even serious standalone knives don’t have this type of steel, maybe only if you look for a Fallkniven or Buck. So this is rare in the multi-tool world too. Also, for little clogging or sticking the saw does the job perfectly. 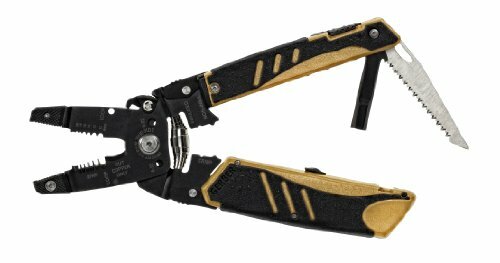 A police officer needs a reliable multi tool for the daily challenges he or she encounters. It is compact and lightweight especially designed for the use of carry and convenience. All the blades and tools have locks to avoid any injuries and unwanted openings. It comes packed with 16 different tools. We kind of get used to the fact that SOG incorporates mostly 16 tools in their multi-tools, they kind of found an equilibrium between weight and functionalities that is very pleasing. This way you know that you get top quality and ease of carry in the same multi-tool. The tools you get when buying the SOG PowerAssist are the following: Two different sized serrated blades, and one straight edge blade, a v-cutter, Phillips screwdriver, HRC of blades is 51-53, to give you a comparison term, a KA-BAR knife with a pretty tough blade has an HRC of 57-58(Rockwell hardness) so you get a pretty tough blade for a multi-tool. It also has a blasting cap crimper, a bottle and can opener, screwdrivers, needlenose pliers, ruler and locks for blades and tools as mentioned earlier. If you are wondering what PowerAssist means, here is an explanation: The system works through the balance of opposing high-tension coil springs. So basically, as you deploy the blade, the force propelling it becomes bigger than the force which keeps it closed. This results in an easy and almost instant opening that is very convenient when time is not on your side, a situation where most police officers find themselves in. Another nice feature is the compound leverage mechanism that works by employing multiple pivot points that cause a better handle travel when using the pliers. The result is an improved leverage so added power to approximately twice the force of normal pliers. As you may know from past models, SOG offers a lifetime warranty. That is a good indicator of what the SOG culture is. Offering the best quality for as low as possible. We choose the Leatherman’s Wave again as suitable for cars, but this time, with a 40 piece bit kit assortment especially developed to help with car repairs and other types of emergencies. It has a total of 16 tools which are the following: A lanyard attachment, a wire stripper, wood and metal files, bottle and can openers, a ruler, two double ended bits, scissors, regular and needlenose pliers, diamond-coated file, a saw, large and medium, screwdrivers and two knives, a serrated one and a fine edge blade. Beware that the extra pieces vary greatly from seller to seller. Basically, the bonus bit kit allows you to do car repairments like changing headlight light bulbs, changing seats on different types of cars, or dissembling different parts of the interior when an object slips between the seats and much more. With the 40 different bits, you hardly find something that cannot be unscrewed or disassembled. This way you get total freedom and reliability. The blades are of a very good 420HC stainless steel that are very sharp and resistant because they have been heat-treated. The serrated one makes it easy to cut different kinds of ropes used for car towing or any kind of wires and cables. It is made in the USA and Leatherman also offers a 25 years warranty for any situation and a quality leather sheath. If you think that the Leatherman Wave multi-tool with the 40 piece bit kit might be what you are looking for your car, you can safely make the purchase. We think you will love it. For electricians, this multi-tool is a blessing. You will get the most important electrician tools on a compact and lightweight multi-tool for a great price. 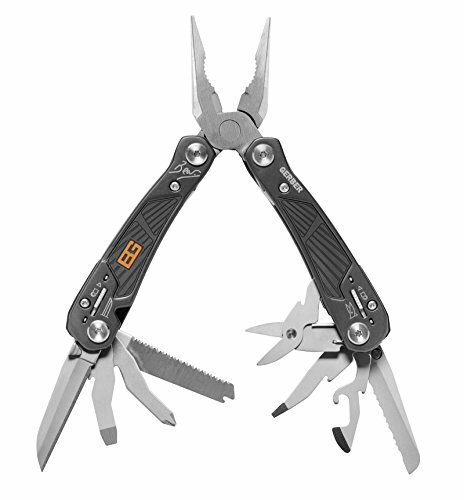 It combines industrial-grade wire cutters and strippers with a high-quality utility knife, saw blade and driver with six bits which are interchangeable, and at an overall length of 9 inches and a weight of 13 ounces you will be able to fit it in a bigger pocket. Even if you don’t like pocket carrying, Gerber offers a pouch that is pretty large and can drop on your belt easily without securing it. • Locking utility knife with five replacement blades included. You can use the Gerber Groundbreaker for repairments of fridges, air conditioners, installing lights and basically every electric range devices. The leverage is not incredible as you might expect from any multi-tool but it works. You will feel the lack of leverage, especially when using the crimpers. Remember that the tool has no insulation so you have to turn off the electricity in order not to make any short-circuit. Overall a great multi-tool with a solid build and sturdy handles that are a must for every electrician that wants to get the job done quickly and hassle free, and for the price we think is really worth checking out. Some may say that it is too sturdy or weighty for a paramedic. Yes, partially true. If you think that 1 pound is a little too much you can choose another one from the list, but we think that a paramedic also needs more functionalities because in emergency situations you don’t know when you need a specific tool. It might come as weird but you might need any tool from the variety SOG put in this multi-tool. Paramedics know that weirdness is a number one concern for every mission. People do crazy stuff so you need to be prepared with the craziest tools. To say only a few of the 22 tools and features, it has the SOG Compound Leverage that offers twice the power of conventional pliers. Generally, when you want power you choose SOG. 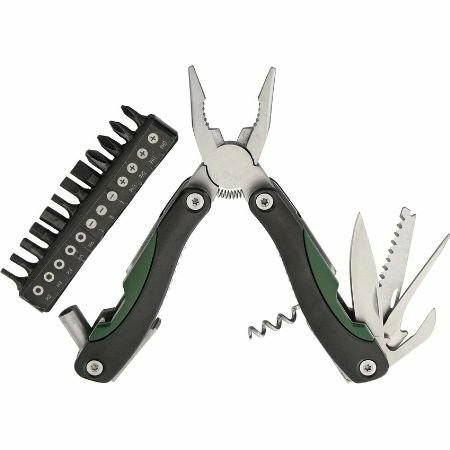 A hard wire cutter, V-cutter, a double tooth saw a lanyard ring, bottle and can opener, a partially serrated knife of very high-quality military grade steel, Phillips screwdriver and much more. SOG offers a lifetime limited warranty that covers many of the damages that will occur. More about their warranty can be found on their website. The nylon carrying pouch is also of good quality. We think the SOG PowerLock EOD multi tool is a great piece to have with you at all times, and for the price, you can’t get more than what it offers. Computer technicians always need a reliable multi-tool to do different small stuff on the computers they are maintaining like cutting wires or unscrewing CPU fans, but they also need a beer bottle opener to freshen them up a bit. Luckily IRWIN has been thinking of all these aspects by incorporating a handful of tools to help you do your work easier. This is basically a 3 in 1 wire stripper/crimper/cutter that features all wire sizing and types so you don’t have to hassle around with other tools. 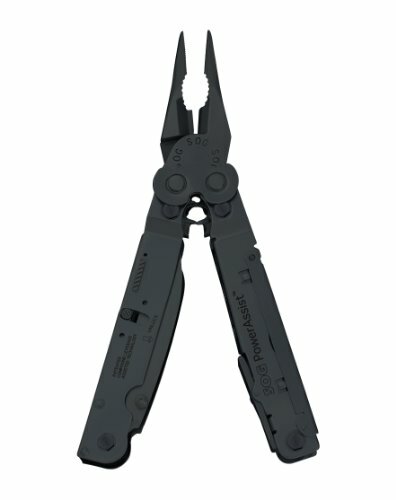 Of course, you might also want some other multi-tool with a blade or pliers in your toolbox, but I think most computer technicians could make good use of this IRWIN tool. The single thing that I don’t really like here is the handles which are unusually tight. That may be good for heavy use scenarios but for ordinary use, it doesn’t make so much sense. Although you don’t get the big variety of tools that can be found on other multitools, you get the essentials at an unmatched quality. For the price, it is worth trying it. When you speak about the Skeletool from Leatherman it is inevitable that somebody might already know what you are talking about. This is one of the most popular multi-tools that many people love all around the world. And they have a good reason to do so. Some say that the Leatherman Skeletool may also be suitable for outdoors and survival activities. We partially disagree with this statement. We think that for survival and outdoor you will be better off with a Charge TTi or a Wave. Yes, it may be true that both that we mentioned are more weighty but they pack so much more tools that you cannot dispense. If it happens that you had both or one of these models you know what I am talking about. This is the ultimate portable multi-tool and just that. It does best where it should. Talking of features there are plenty that needs to be said. First, the opening swing arms provide access to very good quality pliers and screwdriver and the screwdriver gives access to 4 different screwdriver heads since the removable bits are interchangeable and the handle also has an extra bit. It is true that you only get a combo blade made of 420HC stainless steel. This is the sacrifice Leatherman had to make in order to get these dimensions, but if you take it this way you may find that you might not need those fancy blades. Is there any emergency situation that you have found yourself in that can’t be accomplished with a blade or wire cutter? Probably not if you are a regular user. So one good combo blade should be more than enough. The tools it packs are the following: Needlenose and regular pliers, hard wire cutters, carabiner and bottle openers, large bit driver, and the 420HC Combo Knife. That’s it, no fancy screwdrivers on any stuff that you might never use. It comes at what we consider a good price for what it offers. You can make yourself or somebody else a nice present with the Leatherman Skeletool multi-tool. No matter who you buy it for, it’s gonna be love in the middle. Motorcycling is a pretentious subject. Here for some this multi-tool might be a perfect choice and for some, it may be the least favorable choice. So if you came here for a motorcycle multi-tool we advise you to look very carefully at what you need because that might make the difference between contempt and happiness. 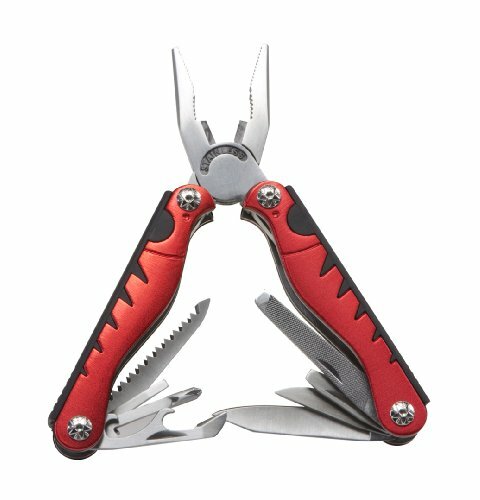 So what is the main reason why this multi-tool is good for a motorcycle? Well mainly because of the vast amount of screwdrivers and wrenches and the variety of different bits. It has 3 flat head and 3 Phillips screwdrivers and 5 wrench sizes. It is easy to operate with only one hand, a feature that is demanded not just by regular multi-tool users but also by most motorcyclists because when something breaks on your motorbike you will have more than sure one hand occupied with something else. It comes with dimensions of 4.5 by 2.36 by 1.57 inches and weight of 12 ounces which is what we consider versatile and lightweight compared to others. The nylon sheath is not of top quality but still good enough for regular carry. The 18 functionalities that it packs include the 6 screwdrivers and 5 wrenches so you remain with 7 other tools: Universal and cutting pliers, regular knife, hole punch, a hole for the thread, corkscrew, saw and a can opener. If you think it has what it takes to put your motorbike on the move, make the purchase with confidence. 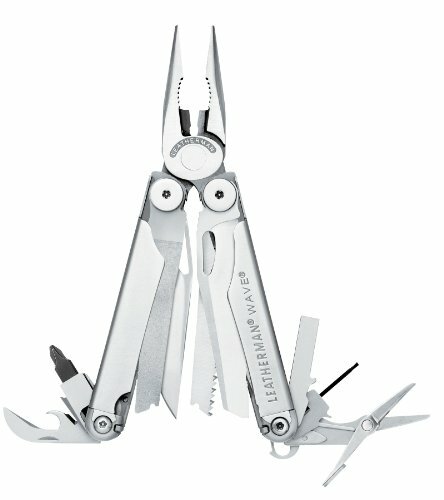 Yes, the Leatherman Titanium is probably the best multi-tool you can get if ever thought of buying the best of the best. But that’s not all. Depending where you buy this multi-tool from, in the box, you would probably also get a bunch of perks and additional tools that you would have to buy separately otherwise. Again these extra items greatly vary from seller to seller. The handles are of high-quality titanium that will resist for a long time, and the rest of the body is made of stainless steel. Leatherman thought about the small details that other companies seem to not care and introduced a simple but very important feature which is a lock for every blade and tool so that you feel safe and handle however you want the tools and especially the blades. 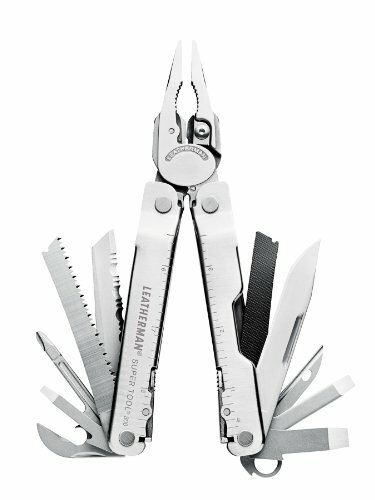 Leatherman has a tradition in offering long warranty periods for their tools. For example, here they give 25 years, that’s because they are sure that you won’t send it back complaining that it doesn’t deliver enough quality. Speaking of the blades they are of very good steels. The serrated one is from a 420HC stainless steel which is an improved high carbon form of stainless steel and is optimized for strength and fine cuts. And the powder made stainless S30V steel has an exceptional corrosion resistance and holds an edge for almost six times longer than a regular stainless steel. You can use this blade as your daily knife without thinking of sharpening anywhere soon. It is true, you pay a bigger price, but, at least, you know that your money went into a safe investment. We always encourage people who cannot decide on any item from any kind of branch or domain to choose the best quality even if that quality comes at a stiffer price. Mainly because it always pays off way more than cheap copycats. That being said it is up to you if you prefer long-lasting quality for a somewhat bigger price or a cheap multi-tool. Our advice is to go with the first one. This is a pretty simple multi-tool at a highly affordable price. You basically get 12 different tools in a lightweight easy to carry multi-tool. It has the following tools: Corkscrew with assist for easy opening, regular and hard wire cutters, bottle and can openers, regular and needle nose pliers, small, extra small, medium, large and Phillips screwdrivers, and a nice and sharp 420HC knife with a good blade. The knife has a regular stainless steel blade that Leatherman uses a lot in their multi-tools. They use it so much because they kind of peaked the top limit in quality for such a small blade. Their blades are reliable and last for long periods. A thing that is pretty annoying is the blade’s length. Seriously, they could just make it a little longer and everything would be perfect. Anyways overall this is the single complaint we have about it. The handles are made of type 2 anodized aluminum which is both lightweight and resistant at the same time, and with the Leatherman 25 years warranty, you have full coverage. 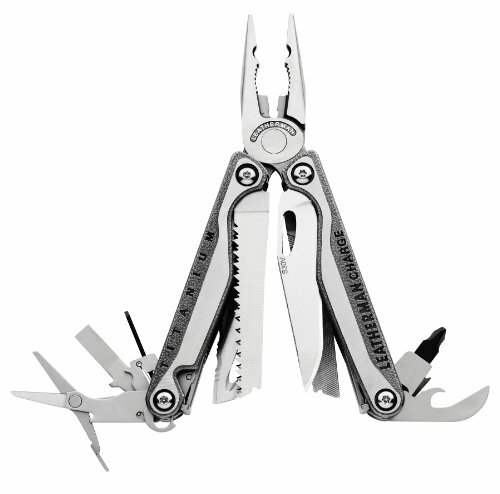 For this price, you can’t go wrong buying the Leatherman Juice C2 multitool. The Gerber Black Diesel is one of the most user-friendly multi tool you can find and can be used for a variety of jobs from unexpected experiences in a road trip to outdoor situations. Whether you use it for work, travel, outdoors, or maybe all of these, the Gerber Black Diesel will come in handy at any time. From cutting through zip-ties or getting a stuck screw out with the strong pliers. It will save you many times from a lot of hassle, you’ll see, and all in a very intuitive form that even kids can figure out. Speaking of the blades it has a saw blade and a partially serrated, partially plain one, that are made of a very high-quality steel and will last for long periods without any sharpening. You shouldn’t worry about the strength of the pliers because they offer incredibly good grips and force for most operations. It has locks that prevent unwanted openings of tools but even if this happens, the tools and blade open towards the center. Why get a complicated or a cheap one that you don’t need? Why the risk of having tools that you don’t actually need that add up to the weight when you can own the one and only intuitive and reliable Gerber Black Diesel multi-tool that will do the job whenever and wherever? We think you already know better. There is a very good reason why we choose this as the multi-tool with the best scissors. And for this, we only have to say one word. Fiskars. Yes, the scissor on the Gerber Pro Scout multi-tool is a genuine Fiskars scissors. You may already know that Fiskars has an experience of almost 4 centuries of building tools that empower people to do the things they love easier. It started from a small finish village to develop in a world-class company that many people love. The Gerber Pro Scout doesn’t only have some of the best scissors on the market but also plays in the top branch of tool quality. They included 14 different tools of high reliability to make your everyday life easier. Now many people have the need of the one hand opening and operation which is normal considering that we only have two hands and in many situations one of them is already occupied. Well, of course, Gerber thought about this and made it easy for one hand use with only one flick of the wrist. 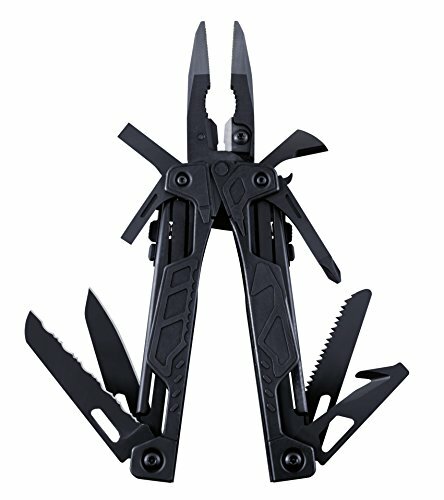 Depending where you buy this multi-tool from, it should come with a ballistic nylon sheath that is pretty good but not something to praise about. It is enough for what is intended. Do you think the Gerber Pro Scout would fit pretty well in your back pocket? We think it will. Why not make yourself a nice present? The Real Avid multi-tool has some pretty unusual tool combinations that turn out to be very useful. Like a combination of Needlenose Pliers with a carbide cutter, G10 grip plates or an oxide coating that proves to be very durable. We have to say that the partially serrated knife has one of the toughest and biggest we have ever seen on a multi-tool besides the pliers which are also fantastic. It measures 3.25 inches and it has a razor-sharp edge with good retention and can pretty much replace for a while your standard knife. The sheath is designed to carry additional parts like bits and the Front Site Adjuster and is pretty much one of the best sheaths for a multi-tool available now on the market. It’s beautiful, easy to carry and has a good design. Real Avid nailed it with the sheath really nice. Not just that its tools are of high quality but also in a large number: Carbide cutter, G10 grip plates, Carrier scraper, A1 & A2 front site adjuster, interchangeable hooked pick and pin punch, cotter pin puller, combination of needlenose and regular pliers, metal file, serrated tanto knife, 12 high quality bits with driver, bolt, firing pin, cam pin scraper and 8-32 female and male thread receivers. We hope we included all of them. Anyway as you may have seen it has a pretty unusual configuration. 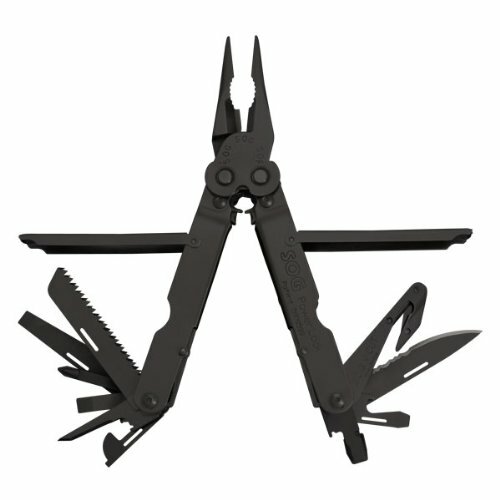 If you check out a Leatherman’s or a Gerber’s tools you can see major differences in the tools they carry. Our best advice that we can give you is to not leave home without one of these. It will make your life easier. Consider that for the price you are paying this multi-tool will save you many times. Straight off we have to say that this should be your choice when you have nothing else than the change in your pockets. 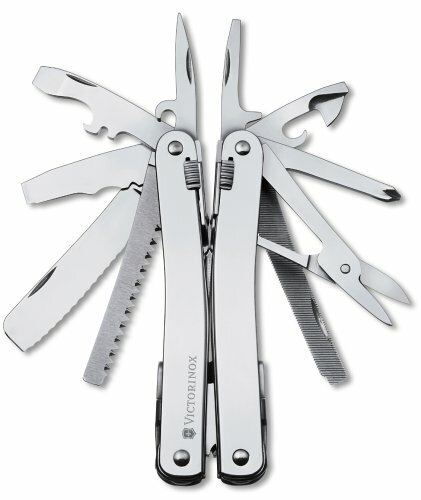 The Tekton 10 in 1 Multi-tool will never be a real competitor to a serious more expensive Leatherman, Gerber or SOG. That being said let’s see what you get for this price. You get a somewhat good build with anodized aluminum handles that have soft rubber grips for sure nonslip control that incorporates regular pliers, wire cutters, awl, Phillips and slotted screwdrivers, a frail saw, can and bottle openers, file, regular knife. Now let’s speak a little about the most important tools. The pliers have a spring action mechanism that basically returns to open position to reduce hand fatigue. That is good but don’t expect fantastic grips from this pliers. The blade of the knife is reasonably sharp and is made of regular steel but they will need a sharpening now and then. • The wire cutters seem to be the best tool that the Tekton has. It seems that it does the job as it is supposed to. • Awkward movement of the tools when they were not supposed to move. This may be also problematic regarding safety. You have to be careful in order to avoid cuts or injuries. For the price you are paying for it, we think that Tekton did a pretty good job with their 10 in 1 multi tool. If you don’t have enough money to buy another one just stick with this one. You should be better off with it than nothing. First is obviously the way you use it. Do you love doing DIY work around your home? Then probably a professional one that is not so carry-friendly but has a lot of features, blades and small perks, should be your best pick. Do you love camping and outdoor activities? Then you definitely need a good blade on this one but also, it has to be lightweight because you have other stuff to carry as well. The next thing to consider is how you are going to carry it. Perhaps you are a road cyclist and love the long roads, and at some point, your bike has a problem. Lovely, your new 25-functions 2-pound new multi-tool would surely have come in handy. But wait, you didn’t take it on your long road trip because you wear a Lycra suit and it didn’t fit in your small bag. That is why size and weight are hugely important, maybe the most important. Be as objective as possible when it comes to this. After you have identified your specific needs and the size, you need to ask yourself if a multi-tool will do the job, or a real tool would be more appropriate. Remember, a multi-tool is not a real tool at all. It’s a means to bail you out of an emergency situation where you don’t have real tools available. It’s true that a quality multi-tool will come much closer to the use of a real tool than a cheap one, but it’s not anywhere near a true knife or screwdriver. If you have to screw 100 screws and think that a multi-tool is good enough you got it wrong. Multi-tools are not meant to be professional replacements of real tools, that is why is better to get a real screwdriver for those screws. When you got all these details clear, you may proceed and make the pick that you think fits your needs. Do you need a professional one but don’t feel like pulling out more than a hundred dollars? Well, you may find something that cuts it, but keep in mind that in time you will discover all the small things that make the difference. Take our advice – spend a little extra, and get the tool that is more likely to get you outta there.